BP Oil Spill 2 Years Later: For Dauphin Island, Cure Worse Than Disease? 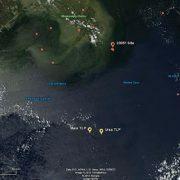 There’s been plenty of ink the past couple of weeks about the lingering impacts of the BP / Deepwater Horizon oil spill in the Gulf of Mexico. Two years ago here at SkyTruth we were just beginning to raise the alarm that the spill was actually much larger than we were being told by BP and government officials, and that the nation’s previous worst oil spill — the Exxon Valdez disaster — had already been surpassed. 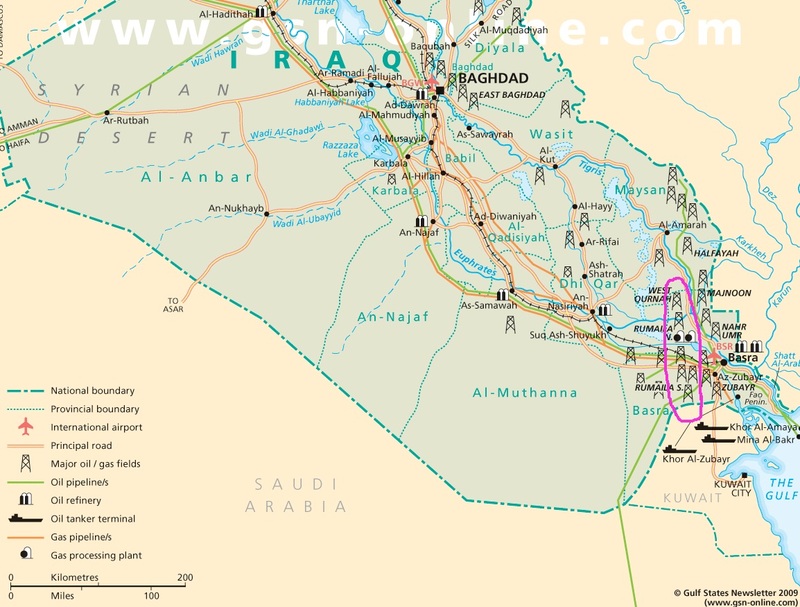 Months of agony and economic loss followed for folks in the Gulf region and beyond. Recovery has come in fits and starts, with mixed news for offshore drilling and tourism (generally up), and for fishing and the environment (generally down). 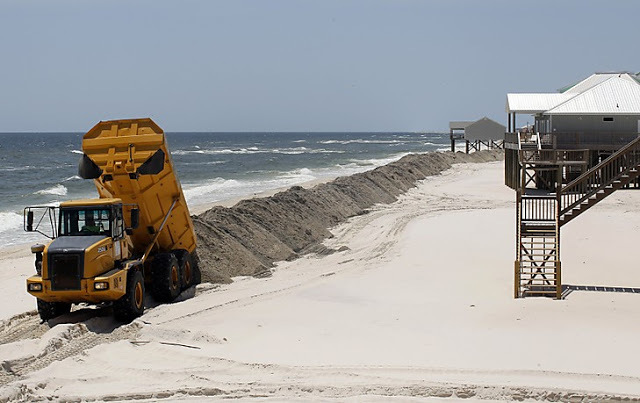 Sand berm being piled up along Gulf side of Dauphin Island during 2010 BP / Deepwater Horizon oil spill. Photo courtesy The Washington Post. 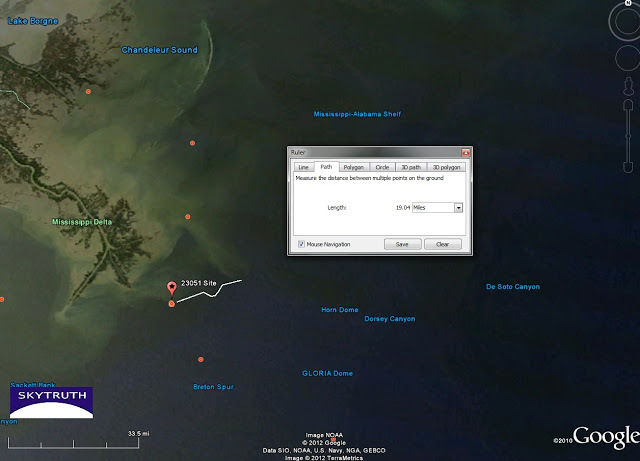 West end of Dauphin Island in May 2010. Excavation of sand to build a berm along south (Gulf) side of island is underway; sand is being removed from pits on the north (Sound) side. 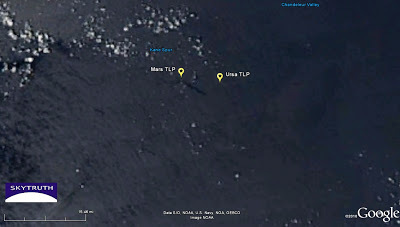 One pit has already filled with water (dark rectilinear shape at right center). 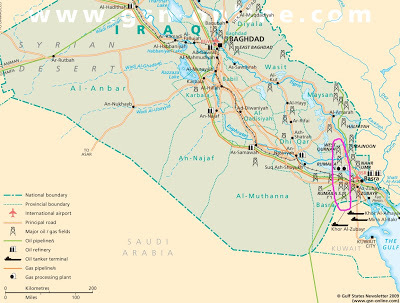 Same area in January 2012. Sand-excavation pits are now ponds filed with water; some have eroded to the point that they are open to the Sound. 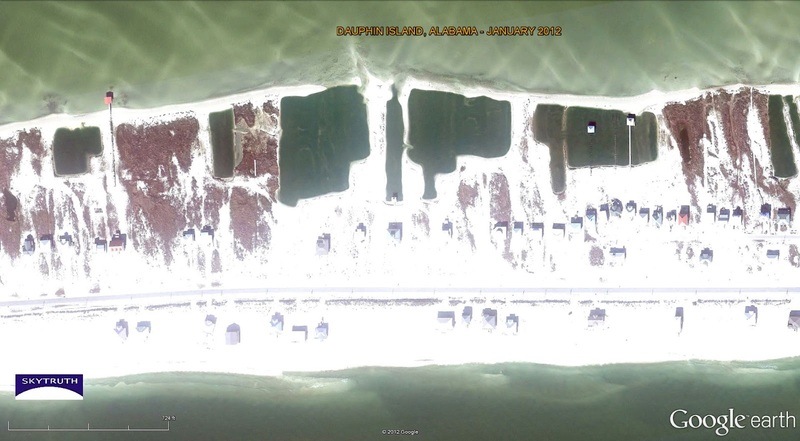 One coastal engineering scientist thinks the eroding sand-excavation ponds are now a weak spot in Dauphin Island that could become the next breach when a major storm hits. This area full of houses now looks strikingly similar to how an undeveloped stretch of the island a few miles to the west appeared before it was breached by Hurricane Katrina in 2005. Called the Katrina Cut, the mile-long breach had grown to nearly 1.4 miles wide by June 2010, when the Army Corps of Engineers began piling up a barrier of rock and sand to close off the gap and block BP’s spilled oil from entering the Sound. 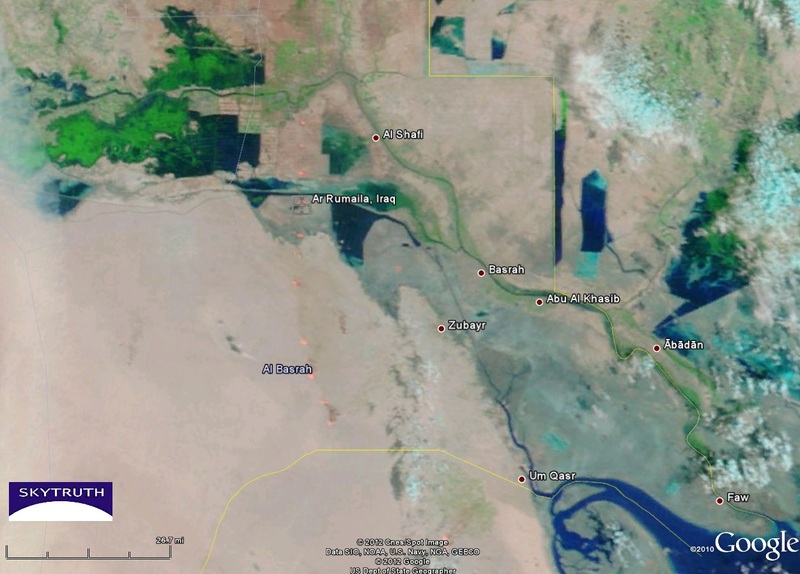 This barrier ended up costing $17 million, and didn’t fully close the Cut until January 2011 — four months after BP’s runaway Macondo well had been plugged, and just five months before the whole danged thing was supposed to be removed, according to the original construction permit. The State of Alabama is asking for permission to keep the structure in place, although one scientist thinks that’s not a good idea. 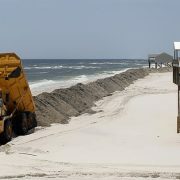 What’s more, the sand berm was apparently piled on top of water and sewer lines servicing the island, causing potential problems and additional expense for future maintenance work. In this case, it looks like the actions taken to minimize damage from the oil spill might actually cause worse impacts down the road. Will we be making the same dubious decisions when the next major oil spill comes around? 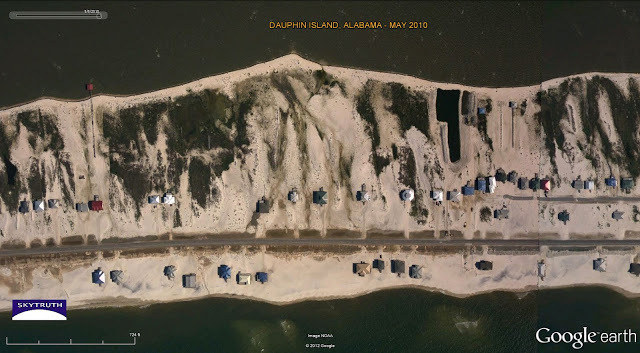 View a slideshow of our time-series images of Dauphin Island, or check them out one at a time in our Flickr image gallery. https://skytruth.org/wp-content/uploads/2012/04/DauphinIslandsandberm2010.jpg 403 640 John Amos /wp-content/uploads/2016/08/test_logo.png John Amos2012-04-30 18:12:002019-02-20 14:54:50BP Oil Spill 2 Years Later: For Dauphin Island, Cure Worse Than Disease? In this MODIS/Aqua image taken yesterday, you can see a wildfire burning northwest of Carrabelle, Florida. 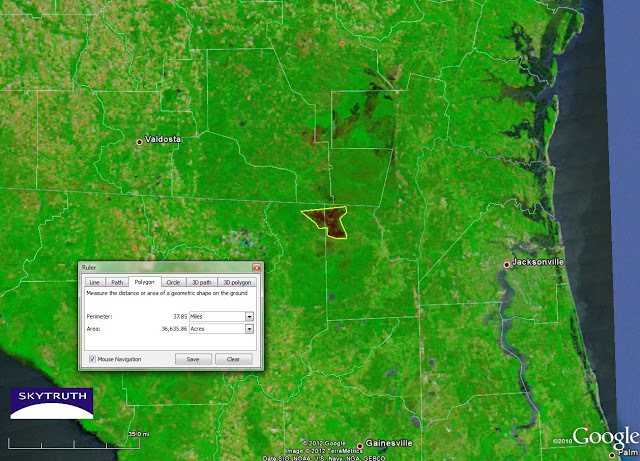 This fire has to be burning extremely hot for it to be visible in this band 7-2-1 infrared composite. 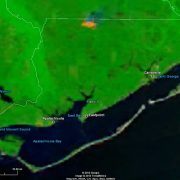 In the MODIS/Terra true color image from the same day, you can clearly see the smoke plume blowing to the northeast from the fire. 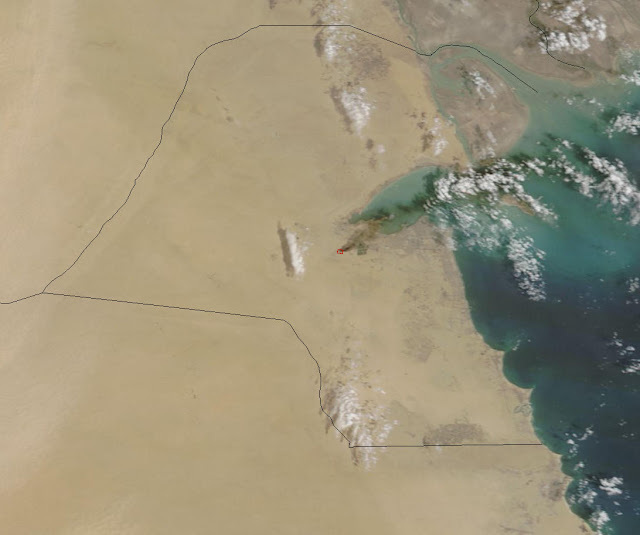 No sign of smoke in today’s MODIS/Terra image of the area, so it looks like this fire has been extinguished. 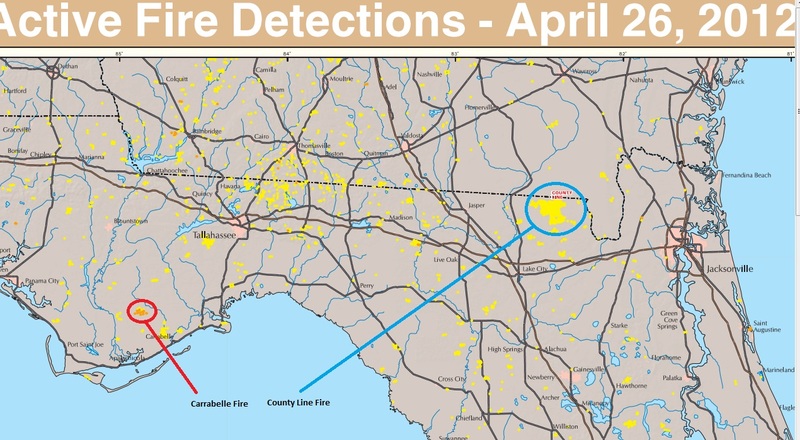 In this cool graphic from Active Fire Mapping, you can see where this fire was located, along with many other fires burning. You can also see the location of last week’s County Line fire. 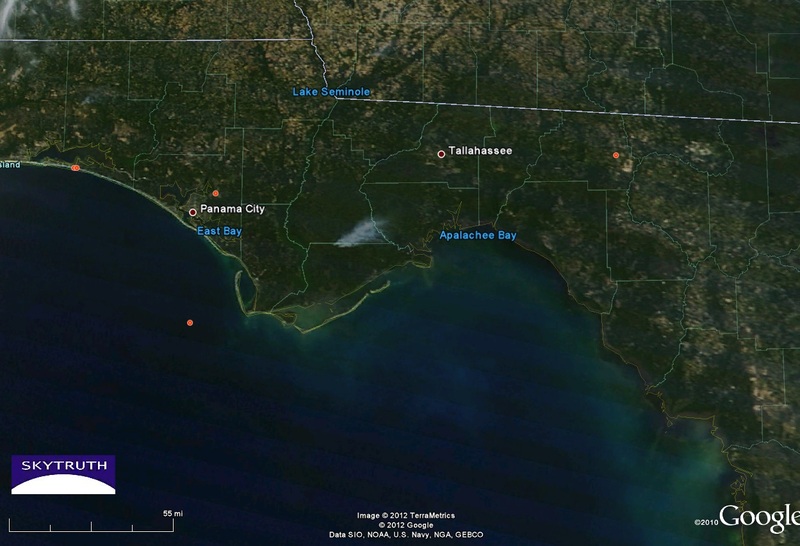 And as follow-up to the Florida wildfires we blogged about last week, in the MODIS/Aqua 721 image below you can see the scorched earth left from the County Line fire which burned over 36,000 acres of forest. 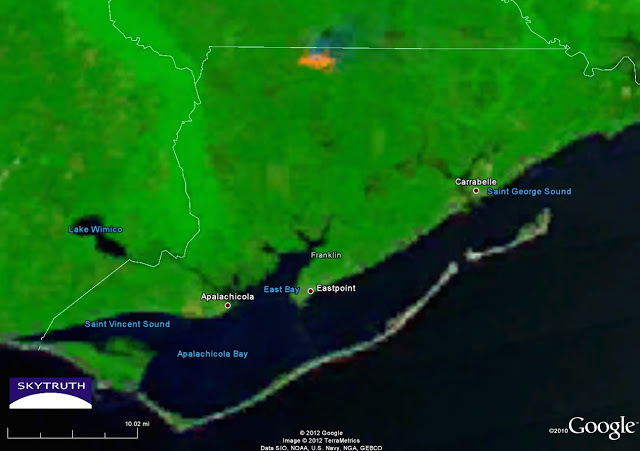 Read more about last week’s fire on NASA’s Earth Observatory site. 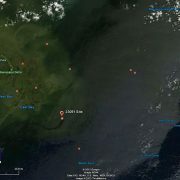 The report from the 25th was taken at 9:00 a.m. and the MODIS image that shows the slick was taken about 2 hours later. 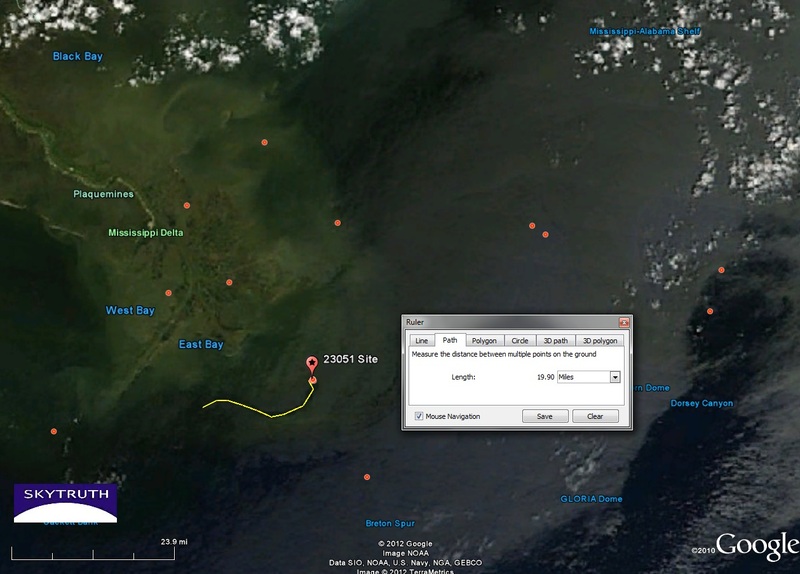 We don’t think it’s likely that the slick could have grown from 4.8 miles long to over 19 miles long between the time the report was called in and the time the image was taken. 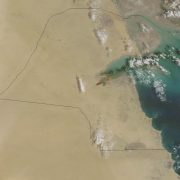 It’s possible that under the right conditions satellite imagery is a better tool for detecting and measuring the full extent of a slick than direct observation from aircraft or on the water. Check out the MODIS/Aqua image from 4/19. 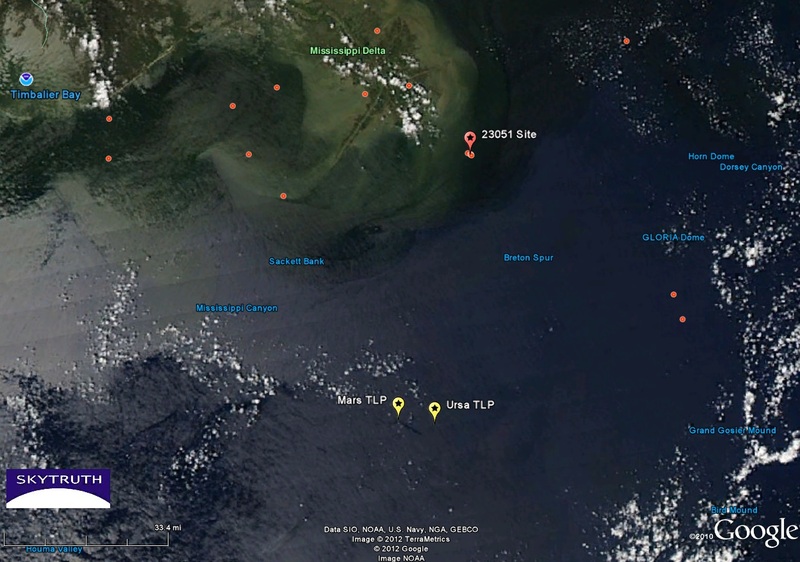 The wide shot shows the position of Shell’s Mars and Ursa platforms, south of the Mississippi Delta, while the close up shows what appears to be a slick of at least 5.5 miles that seems to originate from the location of the Mars platform. Wind was blowing from the north-northwest when this image was taken. 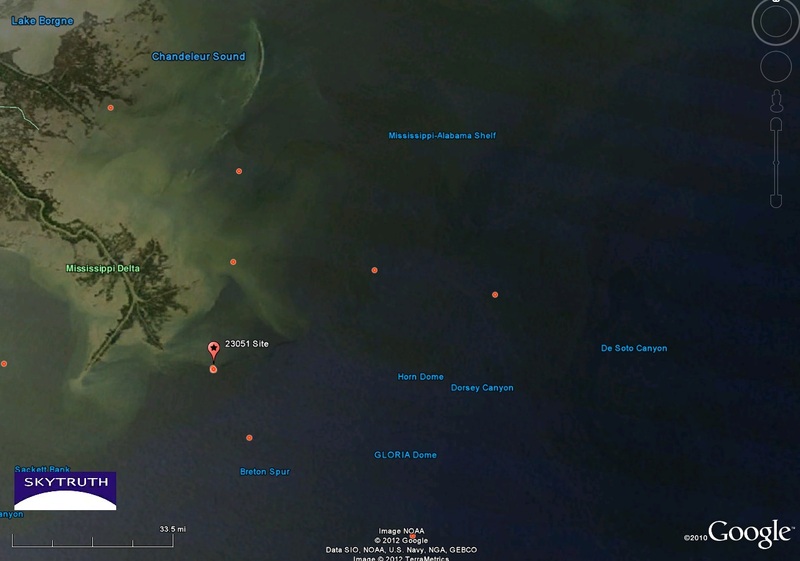 There were no NRC pollution reports (red dots on the image below) on 4/19 for the Mars platform, for Shell or for Mississippi Canyon 763 where the Mars platform is located. 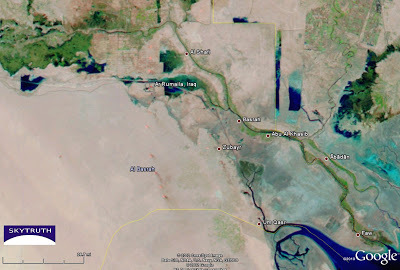 Detail from MODIS/Aqua image taken 4/19/2012. 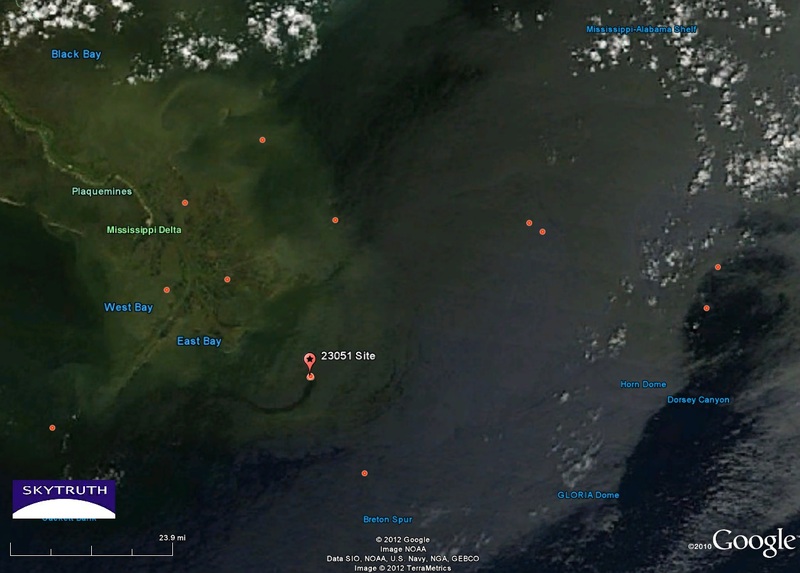 Red dots indicate locations of recent NRC oil and hazardous materials spill reports. 23051 Site marks the location of a known chronic leak from Hurricane Ivan-damaged wells. We’ve been keeping an eye on these two platforms since we reported last week on Shell’s report of a 10-mile long slick between the Mars and Ursa platforms. 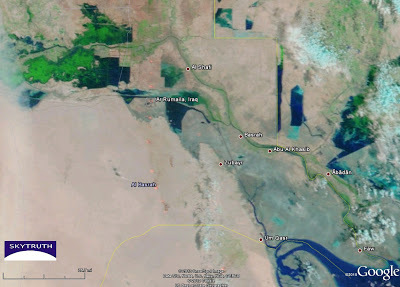 It’s unclear if slicks in this area are from human-caused leaks and spills or natural oil seeps that are known to be in the vicinity. Call it another case of image serendipity. Once you start looking carefully at satellite images, you never know what you might find!